For any startup, the last thing you want to do is waste money, especially in the early stages of development. With the right tech systems in place, however, a startup can get off on the right track with a smart budget for long term success. There’s no reason a business, especially a young or small business, should pay too much for systems that are too big for their needs anyway. For example, when it comes to choosing an office phone system, many startups will find that a hosted VoIP system is their best bet. VoIP uses the Internet to make calls instead of traditional wireline systems. This may not seem like a huge difference, but this little tech trick allows customers to save around 90% on their phone bills. VoIP providers are not subject to many of the same fees, taxes, and costs of maintenance that plague traditional wireline providers, and as a result VoIP providers are able to pass those savings along to their customers in every monthly phone bill. 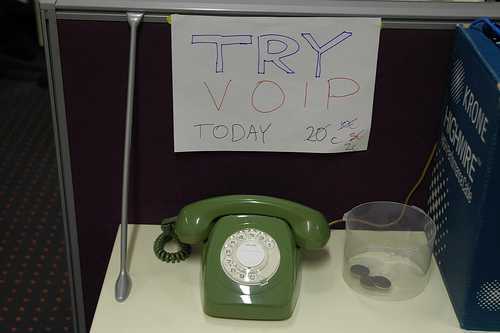 Businesses have a couple of options in office phone service. Depending on office size, calling needs, internal IT support, and budget, you may be happier with one VoIP system than another, and realizing the difference between VoIP systems can make all the difference in your monthly budget, and in turn your productivity. What are your Business VoIP Options? A PBX (private branch exchange) is a piece of hardware or software that consolidates all of your extensions, connects calls between them, and processes inbound and outbound calls. With VoIP, a company will need some kind of an IP PBX, or a PBX that processes extensions based on Internet Protocol connections. Companies can choose between an on-premise IP PBX, or a hosted IP PBX. For most startups, hosted PBXs will be the safest bet as they are low-maintenance, cost-effective, and easy to install. However, in case your startup has a good amount of tech support, you should know about your options in on-premise IP PBXs as well. With a hosted PBX, all a business needs to do is pick a VoIP provider, and the provider does the rest. Hosted PBX solutions cost about $20/extension each month, and you will have your choice between extensions with unlimited calling and extensions with metered calling, as appropriate. Your hosted PBX provider manages and maintains your whole phone system from a remote location, which means you never have to worry about maintaining your own system. Hosted PBXs are also totally wireless and based on cloud hosting technology, and all you will really need is a single computer through which you can login to your hosted VoIP system, and set everything up. It’s easy to add extensions as you need them, and customize features as you want them, all for around $20/per extension. If your startup is based on computers or technology, you may have the resources and know-how to manage your own on-premise phone system. For an on-premise PBX, you will just need the hardware PBX (starting around $600), or you can download a free open source PBX software and build your PBX yourself. You can have as many extensions as you want connected to your hardware or software PBX. With SIP trunking, a business only needs to pay for the amount of simultaneous outside calls they expect to have, whereas with hosted the business is paying for each extension to have unlimited calling. So, a startup with 10 phones that only anticipates 5 simultaneous calls, for example, can save money by purchasing a SIP plan from a VoIP provider that only supports 5 simultaneous calls, at about $10 for each outbound port. That is a total monthly cost of $50, compared to about $200 each month for a hosted system. However, on-premise solutions have a higher one-time cost as you will need to buy all of the hardware yourself. In the long run, it may be more economical to purchase an IP PBX and outfit it with a SIP trunking solution, but maybe not for a startup that can’t invest in expensive hardware so early. With a hosted PBX, the business is purchasing outbound calling for every extension at a slighter higher monthly rate, but they’re avoiding that initial cost. However, many VoIP providers offer month-to-month payment options, so a business could always choose a hosted PBX plan initially and switch to a SIP solution further down the line. Many VoIP providers offer virtual numbers that can be programmed with any area code, usually for as low as $10/month. By selecting several virtual numbers with area codes located across the US, the startup can give off the impression they have a national presence and are a well-established brand, even if it’s a single office based in Omaha, Nebraska. Potential customers will think the startup has locations all over the country, and is unlikely to disappear any time soon. One of the most important things for a startup to do early on is to project a professional and successful image to new customers. Most consumers hear the term “startup” and think the company can disappear as quickly as it appeared. However, if a startup can establish a national presence, they can boost their image to potential customers. Startups can also take advantage of VoIP features to improve company image. For example, auto attendants give the impression of a large internal business network with a highly polished and professional image via their telecom system. Auto attendants also make call direction smooth and simple, which improves caller experience. Most importantly, VoIP systems are cheap. VoIP systems give startups extremely low rates on unlimited calling services in the US. And if your startup will need to do any business internationally, VoIP providers charge international rates starting around $0.01/minute. Startups can also get VoIP toll-free numbers which allow customers to enjoy low rates on calling into their company. Rachel Greenberg is a writer and editor for www.voipreview.org. She writes about technology, telecom, policy, and systems for business improvement. She holds a degree from Johns Hopkins University and works out of the San Diego area.